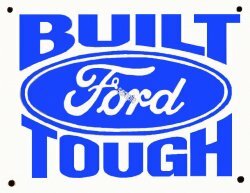 FORD Built Ford Tough - $10.00 : Bob Hoyts Classic Inspection Stickers, Add a Final Touch to your Restoration! This Ford Logo is a more recent Ford Logo. It is appoximately 3 inches long by 2 1/2" high.